Men and Women in the Workplace Presentation Now Available! The workplace is not like school: doing well is more than just making sure you are prepared and know your material. Lots of unwritten rules about the norms at work, and assumptions about the roles at home, can get in the way of successfully integrating work and life for both men and women. In fact, understanding how the genders work together can make a big difference in your career success. What are some common misperceptions? What are unintentional derailers? How do you identify common ground? This course is designed to educate you about those dynamics and how to shape them so that you can construct the life that you want. We loved meeting you at the Forte Conference! We're excited that many of you are about to embark on your two years business school journey. Really take this opportunity to explore what it is that you want to do and then make that a reality! Please don't forget to "like" our Facebook page: http://www.facebook.com/thefoldlondon?ref=ts, comment on the Forte Conference and become eligible to win a dress from The Fold! We look forward to keeping you updated on our upcoming events in your cities! Best of luck with the upcoming school year! Coye recently launched her own line of luxury shoes. She's at work on her sixth collection, distributed in the US, Asia, the Middle East and Europe. Nicole helped launch New York Needs You two years ago providing career and leadership development for first-generation college attendees in New York City. Today they are working with their second class, of 100 fellows and have a staff of 8 with an operating budget of over $1million. Jacquelyn helped turn around a cosmetics company, Vincent Longo, achieving profitability and stability, and today she has clients in social media and software. She's also found time to earn a fine arts degree, which she hopes to combine with her business experience to create a unique blend of business and creative skills. Jai Jai opened the first boutique vintner in New York's historic Harlem, teaming up with a friend to debut what has fast-become a very successful small business. The panel agreed that to be an entrepreneur, first and foremost, one has to be a leader. Nicole recalled that while she was working in admissions at Yale School of Management, something "clicked": she got in touch with a sense of passion and ownership that inspired her to believe that she could own her own future, and led to a career in social entrepreneurship. Jai Jai offered up what she sees as three key traits of successful women in business: confidence, decisiveness and directness. "The latter is very important in corporate America," she says. "Women tend to shy away from the ask. The ability to ask for what you want is one of the traits of leadership that I would apply both to the corporate realm and the entrepreneurial realm." The panel also talked about sacrifices - from leveraging one's home, to passing up a new handbag in order to save those pennies - that they made along the way in order to build their own business. Coye, who started a luxury business in fall of 2009 in the midst of an economic downturn, spoke frankly about how economic conditions complicated even the best-laid business plan. She used her own money to place an order that would support establishing an e-commerce business, something she hadn't foreseen. "I ended up with all of these shoes, which, to my relief, I eventually sold. But the economy was a major obstacle I hadn't planned on, and I overcame it by being flexible. I had my business plan down to the T and within six months, it was irrelevant. You need to be able to rethink things and redirect yourself." The discussion also touched on the challenge of providing infrastructure for yourself as an entrepreneur. "All of those decisions--finding an office space, a computer, clients--all of that is something you make happen for yourself," says Natalie. She also talked about the need to "invest completely" in a fledgling business. Nicole spoke to that kind of total commitment: "I found a passion in my work and, frankly, lost all work/life balance at that point!" she says. The group shared tips on raising funds, building a brand, playing to your strengths and differentiating yourself from the competition. The audience chimed in with their own enthusiasm for entrepreneurship, and it was evident how many MBA women in the room have a goal of career self-determination. Wen Jacquelyn asked how many women in the room consider themselves entrepreneurs and want to pursue that path, more than half raised their hands. It was great to end the conference with that kind of enthusiasm and energy in evidence. Thank you to all of the corporate sponsors, partners, business leaders, Forte Fellows, volunteers and MBA women (more than 400 of you!) who helped make this year's conference such a success. We look forward to following your many successes as you cultivate your careers! Julie Coffman, Partner and Chair of the Global Women's Leadership Council at Bain & Company, and a Stanford MBA, wowed the crowd this afternoon. Julie has fantastic energy and a rich and informed perspective on business leadership. She's part of a senior leadership at Bain focusing on how to bring more women into the leadership ranks. Julie, who is articulate about the business case for gender diversity, says her work inside the firm also helps her connect with clients, many of whom are pursuing the same goal. 1. Define winning your way. "At a certain point, I realized that I was self-imposing how other partners, who may or may not have been similar to me, defined success. I had to get comfortable with what makes me happy." 2. Grow where you're planted. "If you spend too much time worrying about the future, you're not going to maximize the opportunity right in front of you." 3. Follow your passion. "You have to be in a profession that gives you energy." Julie observed that knowing if you're analytical, introverted, outgoing, etc. helps you play to your strengths and "have that job where you just can't wait for the next day." "If you're in a job that reflects someone else's definition of winning, that's going to be exhausting longer term." Julie touched on Bain's strategy for achieving outstanding results for clients by attracting and retaining the best talent. That strategy includes: strategic recruiting and talent management; recognition of "multiple paths to partner"; sponsorship and coaching, and "creating training and dialogue to align culture with our aspirations." Julie's been on a six-month sabbatical until recently, one of the benefits of having served at Bain for more than twenty years. She spent part of her sabbatical traveling with her husband and three kids. Julie calls her role as a mom "The most important thing I ever did." The portrait she presents of a successful woman business leader staying true to herself, achieving career success, and cultivating the future of business leadership invigorated our crowd of MBA women. Watch this space for a forthcoming video interview with Julie. Day two of our MBA Women's Conference kicked off with cooler weather and a full roster of exciting sessions to energize any career. Over breakfast, Cheryl Mainland and Polly McMaster of fashion business The Fold talked about launching a business WHILE finishing their MBA (London Business School, Class of 2011). They talked about building an e-commerce website on a shoestring (tip: adapting Wordpress as an affordable backend solution worked for them), building a brand, and raising capital, and offered some expert fashion advice for our MBA audience ("Always err on the side of formal.") They even planted a few models in the audience wearing The Fold finds (the leather panel dress, edgy AND appropriate, was a particular hit!). We're heading into individual sessions, on everything from how to avoid being pigeonholed as the secretary in your study group to landing the right internship, getting outside your comfort zone, networking and negotiation. At 11:45 we'll break for a conversation with Julie Coffman, Partner and Chair of Bain's Global Women's Leadership Council and a Stanford MBA, focusing on courageous strategies for extraordinary leadership. After lunch, we'll break out into individual sessions again, before our keynote panel on entrepreneurial leadership at 3 pm. We'll hear from successful women entrepreneurs in consulting, business development, fashion and the nonprofit world for a well-rounded picture of women doing it for themselves. Our Dialogue with Leadership is a big part of the MBA Women's Conference, and a great opportunity to hear candid insights directly from senior women executives. This afternoon, Pattie Sellers, editor-at-large at FORTUNE magazine, joined us once more to host the conversation with our two guests, Kristin Peck, Executive Vice President, Worldwide Business Development and Innovation, at Pfizer, and Uta Werner, Chief Strategy Officer at Xerox. Uta, who came to the US from her native Germany, knew as a young person that she wanted to be financially independent. "From there, I concluded that I needed a job that would sustain that independence." Her ambition led her to various academic pursuits in the search for a good career fit. She holds three master's degrees. She started out studying math in Germany, where the distinction between undergraduate and graduate degrees is more fluid, and earned a master's in math and physics. She went on to earn an MBA in Germany and then applied for a scholarship to Harvard, where she earned an MPA. Kirstin, who earned her MBA from Columbia, spoke eloquently about the capacity for business to change the world, and the fact that she was drawn to business as a way to make a difference. Today, she is often the only woman in the room, a fact that she says she would like to see change. In the meantime, she advised the crowd not to hesitate to own their place at the table: "Own your space. Don't sit off to the side, or wait to be asked," she said. Kristin certainly speaks her mind freely in her role overseeing business development: "I know what I think we ought to do and I know how to convince people of that," she says. Kristin earned her MBA at Columbia; over the course of a very successful career since, she says she has learned that having a plan but maintaining flexibility is key. "Life is not a straight line," she said. "Have a sense of where you want to go, but be open-minded as to how you might find those experiences. I spent my career following people; if you can find someone who inspires you in an industry that you're passionate about, you learn so much. I've worked in industries I never thought I'd like, but I worked for inspiring people and that made all the difference." Pattie echoed Kristin's point regarding flexibility. "The world is so unpredictable today," she observed. "You have no idea what the hot job is going to be tomorrow, or next year." Pattie chairs FORTUNE's Most Powerful Women Summit and has profiled top business leaders across industries. Her experience suggests that to succeed in today's business culture, it's important to stay nimble. "Keep your peripheral vision and swing to the next opportunity," she advised. The Dialogue was full of interesting insights. Uta talked about the need to develop "a deeper empathy" in order to understand various perspectives on a business issue. Kristin talked about "watershed moments" in one's career, and the importance of trusting your gut if you have the sense that your pace of learning has slowed and its time to move on - to another division, another company, or even another industry. "If you're too comfortable, change is good," Uta added. "Don't be afraid of change." We'll bring you video interviews with Uta and Kristin soon - watch this space for more. Congratulations to our Edie Hunt Award winners, Kima McCoy and Katie Herrmann! They were honored at our welcome breakfast this morning, sponsored by Goldman Sachs. (Watch this space for forthcoming video interviews with Kima and Katie as they embark on the next exciting chapter of their careers!) The always-inspiring Edie Hunt herself was present (Edie was the first first board chair of Forté Foundation, and oversees talent management at Goldman Sachs) and Alison Mass, Co-Head of Financial Sponsors Group at Goldman Sachs delivered the keynote. Alison spoke about how, having been in the industry for 30 years, she has "always been in the minority", so seeing so many women gathered together (this year's conference is the largest in Forté's history!) is fantastic. She talked about the ups and downs in financial services over her long career, and how those highs and lows have made the industry stronger. She was eloquent about her love of the job ("Being part of an industry inextricably linked to the health of the US economy is always stimulating," she said), and the art of achieving work/life balance. Judging from our Twitter feed (@fortefoundation #mbaconf), many women in the audience were struck by Alison's concept of the "weighted average work week": a philosophy driven by the realization that its not possible to be outstanding in every aspect of one's life every day, but it is possible to master the art of living by seeking an overall balance. Alison is a great example of such balance: married and the mother of twins, she still manages to have dinner with her parents every Sunday night, spends "at least 20 days a year" on the ski slopes, and makes time to serve on the boards of several charitable organizations. Alison concluded with a reminder of the importance of relationships. "Every career opportunity I've ever had has been the direct result of a relationship I've cultivated over time," she observed. Her reminder to "love your work and make time to connect with the people around you" painted a portrait of leadership that inspired many of the women in the audience. Stay tuned for more coverage from our Dialogue with Leadership, coming up this afternoon. "Top 10" things to know before you go! To help get you ready for the MBA Women's Conference on June 10 and 11, we've included the "top 10" things to know before you go. This important information will help make your experience at the conference a success! 3. A list of all organizations and companies participating - see below. A&E, AT&T, Accenture, Achievement First Endeavor Charter School, Bain & Company, Barclays Capital, BlackRock, Capital Z Partners, L.P., Center for Work/Life Policy, Chevron, Citi, Collaborative Coaching LLC, Coye Nokes II LLC, Credit Suisse, Cummins, Deloitte, Deutsche Bank, Eli Lilly and Company, Elizabeth Arden, Ernst & Young, Estee Lauder, Ethicon, ExxonMobil, Federal Bureau of Investigation, Fidelity Investments, The Fold, Fortress Investment Group, FORTUNE, Goldman, Sachs & Co., Great on the Job, Harlem Vintage, IBM, Institute for Personal Leadership, Intel, JP Morgan Chase, The Leading Niche, Liberty Mutual, Macy's, McKinsey & Co., Mongoose Ventures, Natural Gas Canada, NBA, NYC Dept. of Education, New York Needs You, NMC Consulting Group, Parsons Corporation, Performance Improvement (PI) Solutions, Pfizer, PIMCO, Rent the Runway, SixFigureStart, Sweetman Consulting, Teacher Effectiveness, The Capital Group Companies, The Leading Niche, TIAA-CREF, Uncommon Schools, U.S. Department of State, UBS, Vision2Action/Ivy Girl Advisors, Women's RoadmapTM, Work+LIfe Fit, Inc., Xerox Corporation, AND MORE! Today's the last day to register for the MBA Women's Conference! Don't miss out -- visit the conference website to reserve your seat. Cheryl & Polly are excited to be a part of the Forte Conference this year. We are current MBA students who graduate in July and have left our private equity and general management jobs to pursue entrepreneurship. We’re now expanding our fashion retail business, The Fold, from London to NYC! Here is a little bit about our journey! Polly & Cheryl met on the first day of their MBA’s at London Business School, August 2009. We were lucky enough to have each other in our school-assigned study group and began brainstorming start-up ideas right away…. During her first semester of the MBA, Cheryl found a great side-job with Emilio de la Morena, a London Fashion Week designer. Thanks to Emilio, Polly and Cheryl were fortunate enough to attend London Fashion Week events twice a year! Both passionate about fashion but seeing a gap in the market with fashionable clothes to wear to work…Polly and Cheryl began thinking about The Fold as a business opportunity. Summer 2010, The Fold founders were deeply immersed in speaking to anyone and everyone who knew something about fashion, and particularly the business of fashion. As keen subscribers to The Business of Fashion, we seized the chance to witness Net-A-Porter founder Natalie Massenet speaking in-person at her amazing Westfield offices. The Fold is up and running in London online and through pop-up events. We will be launching in NYC in September! Hope to see you there!!!! Sign up for our newsletter or “like” us on Facebook for NYC launch details! Visit representatives from these companies at the Company Expo on Friday, June 10th from 2:30 – 5:30 p.m. Read more about the Company Expo and get an up-to-date list of participating companies on the conference website. Power Plays: What Does Power Mean To You? At the upcoming Forté Foundation MBA Women’s Conference I will be moderating a panel entitled “Power Plays” during which successful women from the financial and consulting worlds will discuss how and why the rules for women in corporate America are different. Tips shared will be helpful and highly sought by MBA women, of course. At the same time, the entire discussion begs a more personal question of each of us: What does power mean to you? And what makes it important? In my work as an executive coach, I often find that my clients need to take a step back, especially when they’re discussing topics that could be considered business “buzzwords” like power. Stepping back means: a) defining our terms; b) questioning assumptions or beliefs; and c) reflecting more deeply about what’s actually true for each of us. We could assume that power means more money, a bigger title, a corner office, a more generous budget, or “a seat at the table”. But that may not be true for everyone. For some, power may mean having the ability to control one’s career destiny in keeping with personal values and interests. Or power could mean having the opportunity to be creative as a project lead without too much interference from others. Or power could mean making decisions with trust and autonomy such that no one can easily override your decisions. Or, power could mean a bigger title to you. There’s no right or wrong. But before we look for the answers from others, I invite you to think about your own definition first. For more information about collaborative coaching, see our website (collaborative-coaching.com) as well as our blog (collaborative-coaching.com/thinking/). Compiler (n): Person responsible for assembling others' work into the final deliverable, whose tasks may include formatting, writing or editing. Do you find yourself playing this role in the workplace or business school environment? Do you believe this function is valued? Come learn what motivates women to play this role and the positive and negative impact of repeatedly playing this team role. Join Jennifer Bradley Heflin as she presents research findings on this topic. Jennifer worked with three other women at Georgetown University to conduct research on the ‘female compiler phenomenon’. This research project began, as many business ideas do, over coffee in a break room. During casual conversations, several female MBA students expressed that they often felt like their small group's secretary. When completing assignments in small groups, most women assumed responsibility for compiling the team's deliverable. With this in mind, the research team explored the role of the compiler, which they defined as the person responsible for assembling others' work into the final deliverable, whose tasks may include formatting, writing or editing. Jennifer’s workshop, Be the Captain, Not the Coordinator, is offered on Saturday, June 11th. By attending this workshop, you will learn more about different team roles, the perception associated with those roles and how to best position yourself for success. Click here for more information about Jennifer Bradley Heflin. Jennifer’s research findings were recently published in Forbes.com. Click here to view this article. 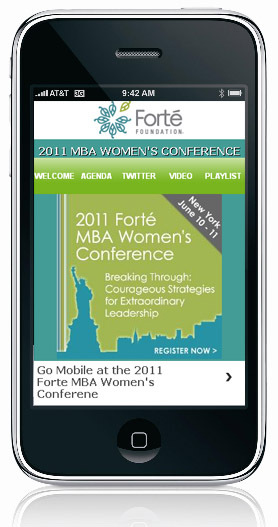 Go mobile: We've created a mobile site just for the conference: http://fortemba.1mobb.com/. We will continually update the site with event information, video interviews, photos, announcements and social media coverage during and after the conference. Add the page to your homescreen* for easy access during the conference. Did you miss the pre-conference webinar? Don't worry if you couldn't attend the pre-conference webinar. You can still listen to the recording and get prepped to make the most of conference networking opportunities. Preparing to network with companies at the MBA Women’s Conference is more than just brushing up your resume. Jodi Glickman, Founder of Great on the Job will discuss all of the aspects related to networking events. You'll walk away with tips and strategies for introducing yourself, breaking into conversations, exiting gracefully, asking good questions, conversation starters and more. A Career Tip from the Academy Awards: Milk It! The Academy Awards have come and gone, but the Forté MBA Women's Conference is just around the corner. Our favorite blogger, Lindsey Pollak, has some excellent tips on "milking it" before, during, and after any big event. I’ve long been a fan of the Academy Awards. Every year around this time I spend who-knows-how-many hours watching the pre-event predictions, the endless red carpet coverage, the three-hours-plus event itself, the nonstop stream of Twitter and Facebook commentary and the days of post-show analysis. This year, perhaps because the show itself was pretty boring, my mind started to wander away from the glamorous gowns and gold statues and started to ponder the genius of the whole Oscars juggernaut. I began to ponder how the Academy Awards organization, the movie studios and the nominated actors are absolute geniuses at Milking an Event for All It’s Worth. This is a good career tip. • See if the event is posted on LinkedIn, Facebook or Twitter and RSVP on those sites in addition to sending in your regular registration. This is a way to promote to your followers that you are actively networking and it also puts you on the radar screen of the event organizers and other participants. • Research the host organization, the speakers and the participants (if you’re able to view a list) so you can make a plan for which people you’d like to meet when you’re on-site. • Follow all of the above people on Twitter and see what topics are interesting to them. If the event you’re attending has a hashtag (for example, #MarketingConf2011), use that in your tweets to show that you are attending, and comment on issues that will be addressed at the conference. • Here’s a tip that’s especially helpful for shy types: Reach out to a few speakers or attendees beforehand by email, LinkedIn or Twitter to introduce yourself and say that you’re excited to connect in person. This makes it much easier to go up and introduce yourself at the event since you can reference your previous interaction. • Introduce yourself to the event organizers. This is especially important if you’re interesting in future speaking opportunities, as many event organizers are already planning for the following year’s conference. This is also a good idea for job seekers — the event organizers may be aware of sponsors or attendees who are hiring. • Tweet! If you haven’t yet installed Twitter on your mobile device, it’s an absolute must for making the most of conferences. I’ve met dozens of people because we’ve reacted to each other’s tweets during a conference. Again, be sure to use the event’s hashtag and follow other people who are tweeting at the same event. Also, lots of people follow the tweets for events they’re not attending, so it’s a great way to network with those folks as well. • Take photos. People love to be tagged online, so snap a few pics (especially ones of you standing with other attendees or speakers) and ask each person if it’s okay to post and tag those photos on Twitter or Facebook. This shows your broader network that you are active and connected, and it’s gives you a great excuse to keep in touch with the people you meet. • Consider creating an “event-within-the-event.” This is a trick I picked up from networking guru Keith Ferrazzi, who always invites a group of event attendees to join him for coffee or dinner to create a more intimate networking environment during a larger networking event. As a less complicated (and less expensive) version of this, simply invite someone you meet to sit with you at lunchtime. • Another great tip from Ferrazzi is to briefly introduce yourself before you ask a question during a workshop or speech (and you should always ask a question!). This makes you memorable to the speaker and the entire audience and often leads to further conversation opportunities. • When you meet someone you’d like to keep in touch with, immediately ask that person when would be a good time to follow up. Jot the person’s follow-up instructions down on the back of his or her business card so you don’t forget. • Schedule all of those follow-up actions into your calendar right away. In addition to scheduling follow-up with the people you met, schedule follow-up with yourself. Many of us walk away from conferences or networking events with a few ideas — “I should really buy that speaker’s book,” “That career coach so-and-so mentioned sounds like someone who might be able to help me,” “I want to look up that website the small business tax expert mentioned.” Don’t let these ideas fall through the cracks! Look through any notes you took at the event or any handouts you received and transfer those action items directly onto your to-do list. • Write a blog post or Facebook note sharing what you learned or experienced at the conference. Many organizations will link to posts about their events, giving you broader exposure, and the people in your network will appreciate that you want to share the knowledge you gained. • Sign up for another event. Momentum is important when it comes to networking, so look around for other opportunities to get out there and milk another event for all it’s worth! Note that this article originally appeared in the Manpower Career Center. Read more at http://manpowerprofessional.com/us/en/job-seekers/career-center and http://www.facebook.com/MyPath.MP. By Cali Williams Yost, CEO and Founder, Work+Life Fit, Inc. But this year, I’m more emphatic. You see, for ten years, I’ve patiently waited for everyone to realize that balance is an anachronism. A holdover from an Industrial Age, with all of its boundaries and rules, that no longer exists. But clearly the realization hasn’t sunk in given the number of Google Alerts for “work life balance” that continue to fill my inbox daily. 10. Will never be taken seriously by corporate leaders. As I’ve written before, when you say “balance,” all that corporate leaders hear is “work less” and the conversation goes nowhere. The minute I started talking about the goal in terms of work+life “fit,” these same leaders began to engage. They saw that they too have a work+life fit that matters to them, but also that there was a business benefit to giving everyone more flexibility to work smarter and better in today’s economy. • Increase the likelihood of that your boss will support greater flexibility in the where, when and/or how you work and, in turn, manage your life. To help you achieve your unique goal, check out my book, “Work+Life: Finding the Fit That’s Right for You (Riverhead/Penguin Group) and join me at Fast Company and my award-winning Work+Life Fit blog. Also, follow me on Twitter. Preparing to network with companies at the MBA Women’s Conference is more than just brushing up your resume. Jodi Glickman, Founder of Great on the Job will discuss all of the aspects related to networking events. You'll walk away with tips and strategies for introducing yourself, breaking into conversations, exiting gracefully, asking good questions, conversation starters and more. Webinar registration is required. Reserve your hotel today - deadline is Saturday May 7! Don’t miss out on a great hotel rate by waiting until it’s too late! We encourage everyone to take advantage of wonderful hotel rates and the opportunity to network with other MBA students from Forte Sponsor schools by staying at one of our host hotels. Group rates and details are located on our website. Are you unclear about your professional direction after your MBA? Do you sense limitations or uncertainties? Perhaps you are even a bit afraid? Don’t be. You’ve got huge potential. Learn how to maximize it. Join Lynne Morton, award-winning executive coach and management consultant on a learning journey through the FUSIONCoaching for High Potential Women model. The interactive workshop will give you insights and get you started on a solid path forward. Lynne’s workshop is offered on Friday morning, June 10. Click here for more information about Lynne and to review her blog with the latest post on Why Develop High Potential Women Differently Than Men, and Why Now. Just Announced - Dialogue with Leadership Presenters Confirmed! Caroline is moderating the panel, “It’s Who You Know”, on Saturday at the Forte MBA Women’s Conference. The typical advice says that you should tell everyone that you are looking. But is that really helpful for management-level jobs or jobs in a very specific industry, say finance? Will people really get leads from their manicurist? If I could choose between help from my manicurist or the Managing Director of a bulge-bracket investment bank, then of course I would go for the MD. (This assumes you are ready to make your pitch; the MD should not be someone you practice your pitch with.) If access is equal and you are ready to talk intelligently about your search, you should always pick the person who you think is more immediately relevant to your search. However, the rule of thumb that everyone is a networking target is valid because you don’t know exactly what or whom everybody knows, so reaching out broadly doesn’t hurt and may actually help. Furthermore, you may not have access to the MD of a bank or other decision-maker in the area you are targeting and you have to start with the network you have. Perhaps the manicurist house sits for the MD or was a banker and is working as a manicurist in preparation for opening her own spa. Often, in networking you have to start further away from your end target and work to get closer. A lot of the payoff is in these weaker ties, not in your most immediate circle. Do you know anyone at Companies X, Y or Z? Perhaps someone who used to work there? Do you know companies who do similar work? Someone you used to work with? Someone you went to school with? Someone at the church (or other organization where you know this person)? Assure them that you are at the research stage and looking for information, not a specific job. This ensures that the target knows that all leads are appreciated and takes the pressure off of coming up with job leads. Be ready to answer questions, including what level you are targeting, because your target may need to know how to position you when making an introduction. Above all, be specific. Ask about specific names, specific departments, specific companies. You will only get what you ask for. Ask in a vague manner, get a vague response. Ask with specificity, and it’s easier for the target to act upon your request. Caroline Ceniza-Levine helps people find fulfilling jobs and careers, as the co-founder of SixFigureStart®, career coaching by former Fortune 500 recruiters. Caroline has recruited for leading companies in financial services, consulting, media, pharmaceutical/ healthcare, and technology. She is the co-author (along with Donald Trump, Jack Canfield and others) of the best-selling “How the Fierce Handle Fear: Secrets to Succeeding in Challenging Times” 2010; Two Harbors Press. We’re in the process of building a Forté playlist! Tell us your favorite songs (up to 3) and you could win a free, 1 year premium membership to Forté. We want to know what music inspires and motivates you from the past or present day. Here are a few simple parameters to follow: All artists must be WOMEN, it should be PG rated and it should motivate you! The deadline to submit songs is Tuesday, April 19 at 11:59pm CST. Once we receive all submissions, we will create a playlist on iTunes in the weeks following. As a Forté Fellow, I was fortunate to attend the Forté Women's MBA Conference in Chicago last June, and I can assure you that it is an experience no prospective student, current student, or alumna should miss. Beginning business school can feel intimidating - like standing on the ten meter platform above a deep, crowded pool. There will be lifeguards and coaches to help you once you get to school, in the guise of professors, staff, and mentors, but think of the Forté Conference as swimming lessons and an opportunity to develop a training plan before you make your big leap. Attending the Conference last year gave me the perfect opportunity to update my resume, try out my newly-developed elevator speech, and meet some amazing women who were beginning the same journey, or were further down the road and had advice to offer. The panels aimed at first year women were especially helpful - I received recruiting and career search advice directly from recruiters who worked with MBA students, and from MBA women who had succeeded in obtaining careers in industries that interested me. Through the panels and career fair, I met multiple women that I was able to follow up with after the conference, and started networking with some companies that ended up making my internship short-list. Just as important, I was able to decide that that I was less interested in pursuing a few of the functions or roles that I learned about. The Forté Conference is a great opportunity to learn, and to keep building your business and management toolbox. I look forward to attending this year's conference in New York, and I hope that you will join me there! It’s time again for Forté’s annual MBA Women’s Conference. Each year I look forward to this amazing event because the women in attendance represent a return on the investment of Forté and its partnering schools and companies. It’s the culmination of months or possibly years of introspection, inspiration, and research leading you to the business school of your choice. And while the Forté conference is both a satisfying conclusion of that process it’s the start of yet another journey—your MBA career. Our conference theme is Breaking Through: Courageous Strategies for Extraordinary Leadership. What makes a remarkable woman business leader? What kind of preparation do you need to lead, make a difference, have an impact? Recently I read The Gender Dividend, a study published by Deloitte, that makes the case for investing in women. That got me thinking about the meaning of the word dividend—a bonus or reward beyond what you were expecting. That’s exactly what we intend for the MBA Women’s Conference to do for you—leave you with something unexpected, something that catapults you above and beyond your competition and inspires you to be an extraordinary leader. While you can read all about the conference on the website, my goal is to convey to you the genuine importance and extraordinary benefits of joining us. It’s just two days, but the impact will be far reaching. So often women don’t make the time for critical events like this—they seem indulgent or intangible. But the truth is these opportunities to network, build skills, and invest in yourself don’t come along very often. Forté hosts this conference so you can explore career opportunities at companies early on in the MBA cycle. If you’re just beginning the MBA journey, it’s a chance to figure out what career path is right for you. If you’ve finished your first year or recently graduated, you’ll have the chance to network with other MBA women and our great speakers, panelists, and corporate representatives. At the same time, you’ll develop critical leadership skills through our professional development sessions. And finally, you’ll have a head start on other MBAs out there. Very few opportunities like this exist for MBA women. And because you have been admitted into a Forté sponsor school you are exclusively invited to take advantage of this one. I encourage you to make the time for this important conference and kick off your MBA career in grand style. If you’ve already registered, block your calendars and visit this blog regularly for the latest conference news; and if you haven’t – then make the commitment to be with us! Registration Now Open for the Forté MBA Women's Conference! Register by April 20 and automatically be entered into a drawing to win one of two--$250 shopping sprees to Banana Republic! 2011 Forté MBA Women's Conference Registration opens next week - get ready! If you'll be starting your MBA this Fall at a Forte Foundation sponsor school, or are a current student, you're invited to attend our MBA Women's Conference on June 10-11, 2011 in NYC. This year's theme is "Breaking Through: Couraegeous Strategies for Extraordinary Leadership." You'll get insights into what really makes a leader -- insights that you might not get on campus. And you'll also get to meet other MBA women, from your school and other Forte schools. What a great opportunity to have a network in place before you even begin your program. Stay tuned for more information!